Squeaky, wobbly wooden work tables are a bane of every tool man’s existence. Seriously, there’s nothing worse than walking into a productive day for some contraction or repair work in the basement but soon getting put off by that good for nothing of a table. It can’t hold weight, it can’t clamp wood, it won’t support storage. ordeal, or will it fail to impress you? Let’s find out! The WORX Pegasus is a Multi-Function Work Table, by all means. Thanks to its ingenious and efficient design, this work table lets you do so much that just one Worx pegasus review will fall short to cover its versatility. First of all, the WORX Pegasus work table offers a working surface of 31 inches by 25 inch, which isn’t the most massive, but if you’d be surprised how well it holds load and weight despite that size. And anyway, one of most genius things about this table is that you can expand it! You can double up the working surface by attaching another WORX Pegasus work table to the current one! How cool is that? As for height, the top working surface is 32 inches from the ground, which we think is a versatile height. It isn’t too short that you have to bend and hunch, nor or high that you’ll struggle to reach. It stands on 4 legs so it does a brilliant job by evenly distributing the weight on the working surface. You can use it anywhere but it is most ideal for flat, even surfaces. Apart from that, the WORX Pegasus work table also has a built-in bottom shelf where you can store work essentials like power tools, toolbox, grease, drivers, screws, etc. One of the most useful design details on the WORX Pegasus, however, is that it has a specific spot on the lower shelf to slide in a power strip! How convenient is that? You will no longer have stress over the power outlet being too far or the cable to your power tool being too short because the power source is right on your work table! Now, one thing you’ll learn through our Worx pegasus is that this amazing work table serves both as a workbench and saw table. Not called multifunctional for nothing, ey? Simple as it is as a workbench, the Worx pegasus can transform from a plain table into a full-on, functional, and powerful saw table in less than second. It comes with 2 bars clamps that open to 18 ½ inches and 4 holding legs which lets you do all the cutting, sawing, brushing, drilling, nailing as you want to do! And to take on the challenging load of the work, the work table also furthermore features locking legs so that there is little to no wobbling or movement while you are creating your masterpiece. One very small yet significant detail on the surface of this work table is that it has a measuring scale engraved on it. This eliminates the need for manual measuring with a tape and that is one less job to do! Apart from this, one thing we know users will really appreciate is that the Worx pegasus work table is very lightweight. At just 35 pounds, this table is as light as they come. It is furthermore very compact since it can be folded into a flatter body. Perfect traveler and easy to store! Now, we don’t want you to think any less of the Worx pegasus work table just because it is lightweight because this lightweight table can pack some serious punches! Made from what seems like very high quality hard molded plastic, and despite weighing in at just 35 pounds, the Worx pegasus work table can hold up to 300 pounds in weight. That is almost 9 times of its own weight! But that’s even close to what the sawhorse it holds… .a staggering 1000 pounds! Believe it. With all that and more, the Worx pegasus work table comes with a retail price tag of less than $150! You furthermore get a 3-year manufacturers’ warranty upon purchase, which is absolutely brilliant. An offer we hardly get to see from such affordable work tables anymore. Worx Pegasus is an exceptionally versatile yet easy-to-use workbench & sawhorse. Want to know exactly how to set up and get started with your projects on Worx Pegasus? Unfold the table. To do it, just grab the sides of the table and pull them out and up until the table unfolds completely. Position the table on a solid, flat surface. Install the necessary number of bar clamps and clamp dogs to help you with holding your workpiece firmly in place. Arrange them so you ensure a good grip of the workpiece. For most convenience, place your tools on the inbuilt storage shelf. The slots on the table will allow you to keep smaller pieces like screws and bolts in a secure place. This way, you will keep your instruments organized. Also, attach the power strip to one of the bars right next to the storage shelf to avoid tripping. If you need more workspace, you can expand the Pegasus workbench by attaching another Pegasus via the rubber clamps on the corners of the table. Put your workpiece between the clamps and fix it. Rearrange the clamps and workpieces according to your needs as you work. After you are done, just put away your tools and fold down the table. Worx Pegasus is a compact and highly convenient workbench. Apart from that, it is lightweight yet extremely sturdy. Its worktable surface supports up to 300 lbs. while the sawhorse supports up to 1,000 lbs. Pegasus only weighs 30 lbs. If you want a workbench for home use, Pegasus may be a good pick. It measures 31” x 25” x 32”, meaning that it doesn’t occupy too much space when unfolded. When folded, this workbench is only 5” deep. Pegasus is suitable for larger projects as well, although you would have to get two of tables if you were to work on huge projects. All in all, Worx Pegasus is a quite interesting workbench. It is convenient, compact, light, and greatly expandable. Would you be able to tell us the size of the holes on the worktop? Answer: Of course. The size of the bench dogs is about ¾ of an inch in diameter. You can store the standard items there, no problem. Does the Worx pegasus work table have height adjustable legs with locks? Answer: Great questions! No, unfortunately, this work table does not feature any height adjustability. Fixed height on all 4 legs. But they do have locking mechanisms. What is the size of this table after it is folded? 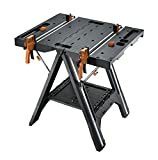 Answer: The size of the Worx pegasus work table when it is folded is about 25 inches in length, 34 ½ of an inch in height, and 5 ½ of an inch in width or thickness. Is it strong enough to withstand a circular saw? Answer: Yes, absolutely! The Worx pegasus is more than capable of your circular and many users have positives, if not brilliant, experiences using most types of saws on it. And a quick reminder, this thing is rated for up to 300 pounds so you are good with the saw! How does it connect to another Worx pegasus table? Answer: Good point. You will find “joints” on each side of the Worx pegasus table. This is where you join the other table too. 6. What is the maximum weight the Worx Pegasus can hold? Answer: The Worx Pegasus can hold up to 300 lbs of weight when you use it as a workbench and 1000 lbs when you use it as a sawhorse. In both instances, it still remains stable thanks to its strong steel material. 7. What is the maximum size the clamp can hold? Answer: The clamp can hold up to 18 inches when opened wide enough. This is wider than most of the workbenches in the industry. 8. Where is this product most likely to be used? Answer: The Worx Pegasus is a flexible product that can be used for several reasons. Some customers have bought it for use at home while others have bought it for use at the workshop. However, it is designed to be used by professionals either at home or in the workshop. Whichever way you choose to use it, it will do a good job. We are almost at the end of our Worx pegasus review, and if there’s anything we learn from it, it is that the Worx pegasus work table is definitely worth every bit of your attention and penny! Yes, while we do admit the issue with the clamps and all, but nobody said it was perfect. For the ridiculous price you buy it for, you get- amazing stability and strength, good storage, fantastic and smart design, superb user comfort and of course, much needed portability. It is darn easy to set up and pack up too! Overall, we give it a 4 out 5 for being such a good noodle. Now, it is your turn to decide! Thank you for your time. Good luck and we will see you next time! Is a purchaser of the Pegasus bench able to buy replacement clamps?